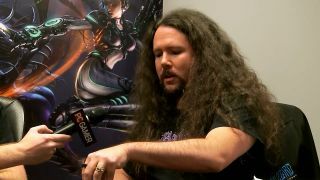 We caught up with Level 85 Elite Tauren Chieftain frontman (oh, and he's also Senior Art Director at Blizzard) at the Heart of the Swarm launch last week to discuss the visual design of the expansion. What inspired the new campaign's aesthetic? How do you create Zerg characters that are both "zergy" and relatable to players? Between the two of us, is there enough hair in this room to knit a sweater? Listen in and find out!